Our strong network of alums rally together in many different ways to support our alma mater, whether it’s through giving, volunteering, hiring fellow Spiders, cheering on our teams, and more. We’re bursting with pride for being part of such a community. This year’s Spider Challenge is the latest instance of that support. During the last 10 days of June, more than 1,300 of you stepped up — from Tanzania to Alaska to Portugal (and tons of cities and countries in between) — to support the place that ties us together. Spiders around the world have given $327,000+ (and counting!) to our alma mater through this year’s challenge. UR Annual Fund and Spider Athletics are neck and neck for the most donors. Jepson School of Leadership Studies surpassed their goal and will enjoy a Homecoming brunch with Dean Peart. Lambda Chi Alpha sits atop the Greek leaderboard with Pi Beta Phi and Delta Gamma close behind. The Class of 2012 is in the lead among our GOLD (grads of the last decade) classes. 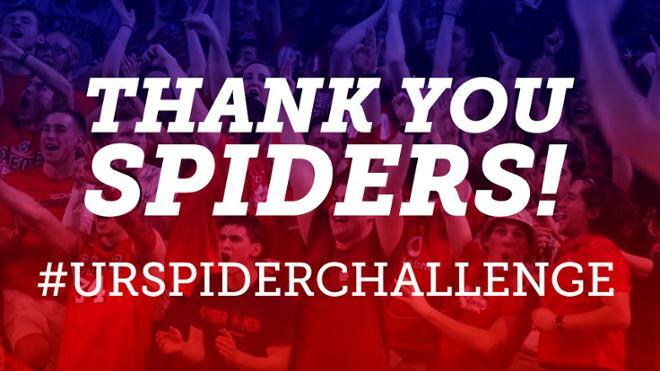 We’re thankful to be intrinsically bound to a network that transcends graduation years, as well as for the #SpiderPride exhibited by all of you every day.